The Knockout Digital team can take your next online production from concept to a successful delivery. Knockout Digital Media is a collaboration of technical professionals who have joined forces to create superior digital and multimedia marketing solutions. We are all leaders in our fields and bring our client's the expertise and vision needed to achieve the best results from today’s media technologies and online web technologies, all while keeping a constant eye on the future and evolving social media platforms. The Knockout Digital team has a passion for online event delivery and live streaming and they "knock it out of the park" every time. One stop shop custom design, development, and programming solutions for your online events and web needs. The Knockout Digital live stream team can interface with your existing production teams or video teams to deliver specific programming. Custom event design integration to fit your current theme. We create a seamless transition for the online guests, from branding to sponsor exposure. Custom event programming to deliver the necessary user data and provide custom functionalities to event pages. Coupled with custom database server programming to collect and sort the data, reporting and analytics. Specialists at delivering events on Facebook Live, Youtube Live, and private non-pay and pay per view platforms. Knockout Digital delivers every time! Knockout Digital Media is committed to excellence in technical quality and customer experience, constantly striving to exceed the expectations of our clients by providing the best world class online services. We treat our clients the way we would like to be treated, their passions become our motivators to provide knockout services every time. As a small team, we have handled some of the largest deliveries of online events and as some of you may know the list of past productions becomes extremely long to list. We have been honored to have delivered knockout style events, webcasts, landing pages, event registration systems, custom video viewing pages, live event setups and engineering support to some really exciting clients throughout the years. As a one stop shop for online events and webcasts we have simplified our services to accommodate your custom needs. Design, Develop, and Deliver, we can take your concept from design to delivery and your next online event or meeting will be a complete knockout. The Knockout Digital team can take your current live event theme and integrate it into your custom online web production, this will create a branding consistency for your entire event. Our developers can develop an online event rsvp system, video platform or event landing pages that will function as needed to deliver the marketing messages or lead generation required for your event. All of our developing is organic and fresh and not machine made. We at Knockout Digital are proud to say, we always deliver a knockout online production. Our success rate is 99.9% and we are proud of it. That comes from hard work, great customer service and the old school teaching, poor planning is planning to fail. We definitely take our time to plan things out and go detail by detail to ensure our clients are satisfied and that their events are delivered like a knockout, but most of all, efficiently. With 20yrs of live streaming experience, Knockout Digital Media can deliver your next event without issue. Our protocol for success will allow your content to be delivered as you had envisioned or better. Our many years of experience coupled with today’s technologies allows you to concentrate on parts of your event that you specialize in. We can take care of the online portion for you. We easily integrate into existing production teams and AV teams to deliver the video signal to your online audience. Many events and micro sites require custom registration systems to access content, we can create those types of registration systems to allow for your team to extract collected data easily. 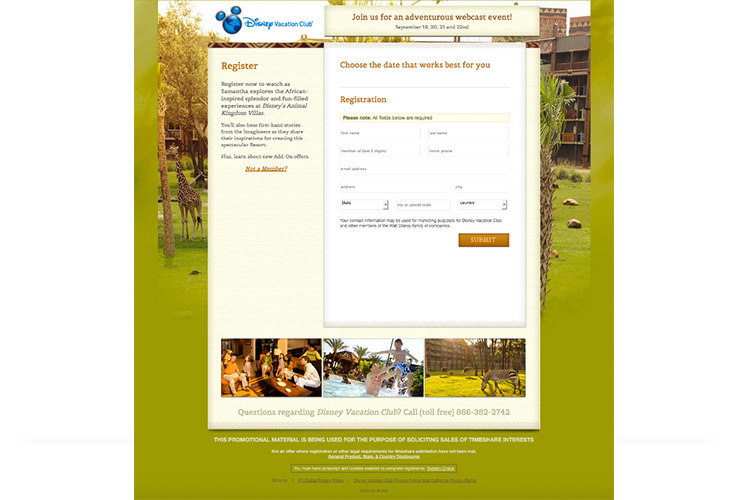 We have built many registration systems for events of all sizes. Our Design team can deliver custom designs that represent your current event theme. This is a huge time saver as we know exactly what to do to make a seamless transition from client websites to a well branded event site. Our developers can create specific custom programming features or processes that will accommodate online data collection and deliver specific user functions to allow for interaction. The Knockout Digital Media team leaders can provide consultation services to get your next project started in the right direction to ensure a smooth online project delivery. Our 25 years of live online event experience from small to large can cover all of your online needs to ensure your maximum reach is obtained. Having been in the online business for over 20 years, our event microcytes have grown and changed with the times. Currently our microcytes display on multiple devices and platforms, we were on the Forefront of that development change in modern web standards. I were aggressive stance towards development allows us to stay fresh and cutting-edge using the latest code techniques for the best user experience possible. The Knockout Digital Media team can create custom video on demand platforms for your content, from pay per view to open free content driven by branding exposure and ads. Need a digital department for your business? Knockout Digital Media offers retainer services. Send us a note on Facebook to inquire. here are some of our past trophy moments. 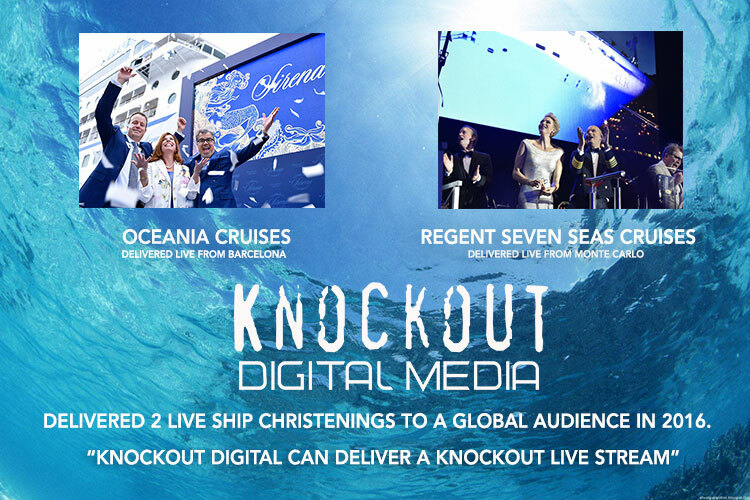 In 2016 Knockout was contracted by Oceania Cruises to deliver the live ship christening of their newest, most elite ship ever built to a global webcast viewing audience live from the port of Barcelona, Spain. Knockout Digital worked with various international production teams to make this amazing event an online success and bring this special moment to an exclusive Youtube audience. Just 2 months after the successful delivery of the Barcelona webcast, Knockout Digital was contracted by Regent Luxury Cruises, sister company to Oceania, to deliver another live ship christening to the world, this time from the Port at Monte Carlo. This live event became global news and reached hundreds of thousands of live online viewers as it featured the Princess of Monaco as the ships godmother. Knockout Digital handled the overseas setup, internet line installation, online live stream delivery, the live to web video production, over seas preparations for internet line installations, and the custom event viewer page development. 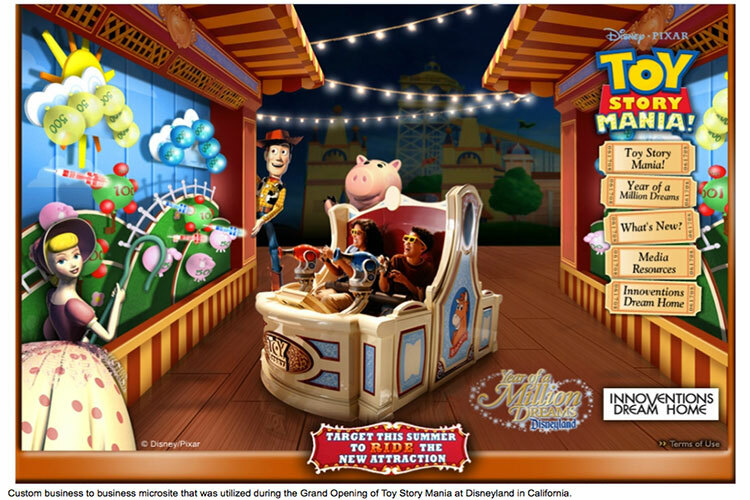 In 2008, Knockout Digital Media was selected by Disneyland Resorts to design, develop, and deliver an online media micro site that was geared for the visiting media attending the live grand opening event, Toy Story Mania. Knockout Digital produced the digital workflow used in creating the daily blogs from the 25 visiting media. 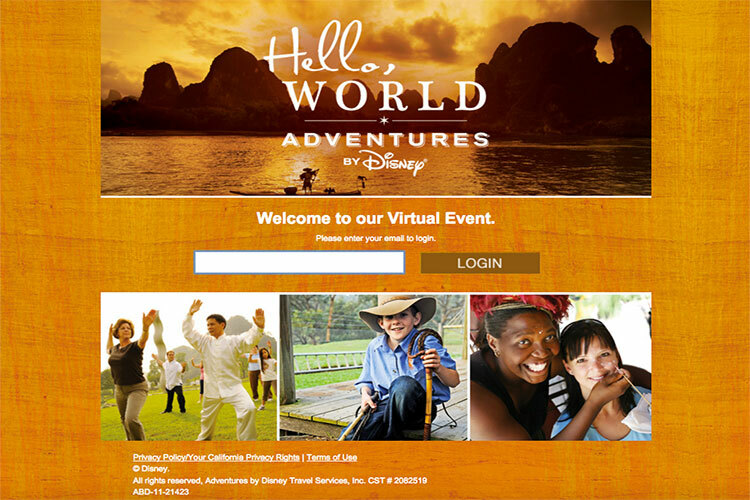 This knockout event set the pace for many events to come in terms of how live online events would be delivered for the Disney Corporation. 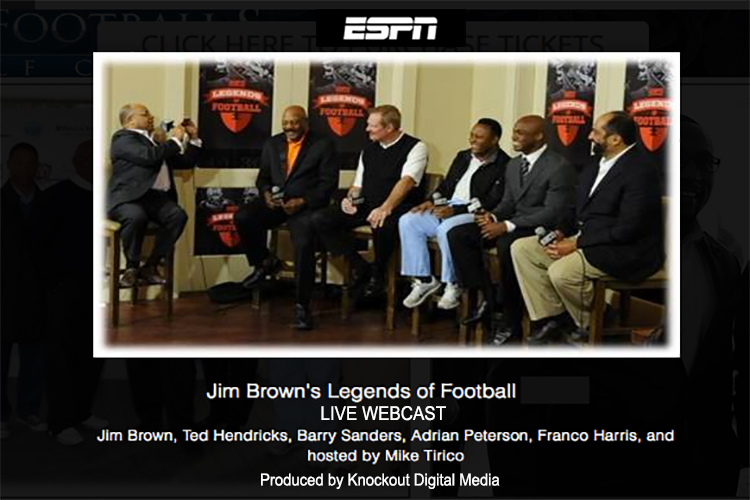 The year was 2013 and ESPN.COM contracted Knockout Digital Media to produce a live interview show with six legends of football. Mike Tirico was the host and Jim Brown was the guest host. The very private event was held in New Orleans during Super Bowl Week and was delivered live via a live webcast to ESPN.COM public viewing. Knockout Digital Media provided all the production gear and live stream engineering. This was the first Legend’s of Football ever produced. 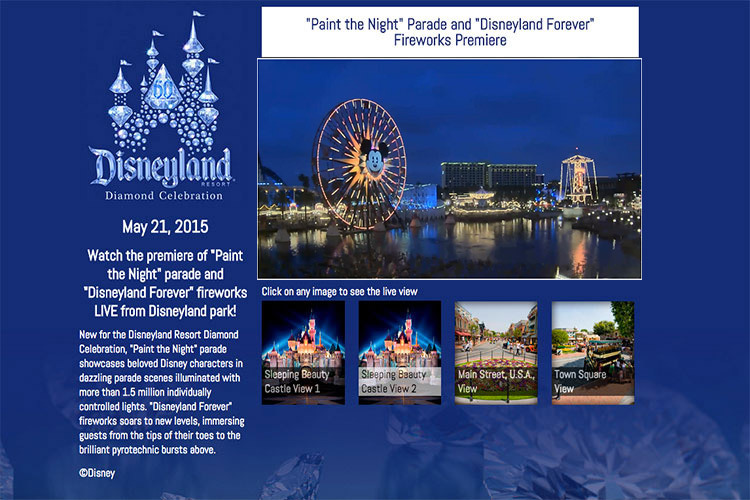 This was a private engagement produced by the Disneyland production team and delivered to a private live audience and a global online audience. Knockout Digital Media provided the live stream platform and provided the page design and hosting for the event along with live streaming support to the DLR to execute the live stream without flaw. This production was a virtual event registration system created from scratch by Knockout Digital Media. This system provided in depth data collection and login access to view streaming video presentations. The Knockout team provided the design, development, and the delivery of this virtual event system. 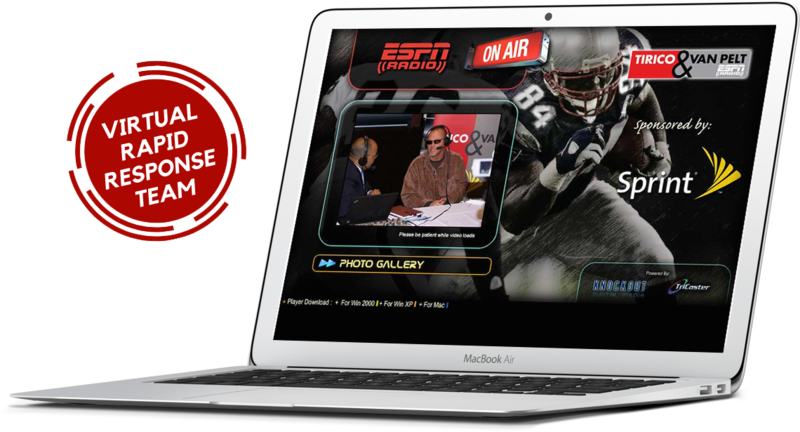 These were the early days of live streaming when ESPN Radio was aggressively streaming all their radio shows and Knockout Digital Media created the platform for ESPN Radio and ESPN.COM to deliver their shows. 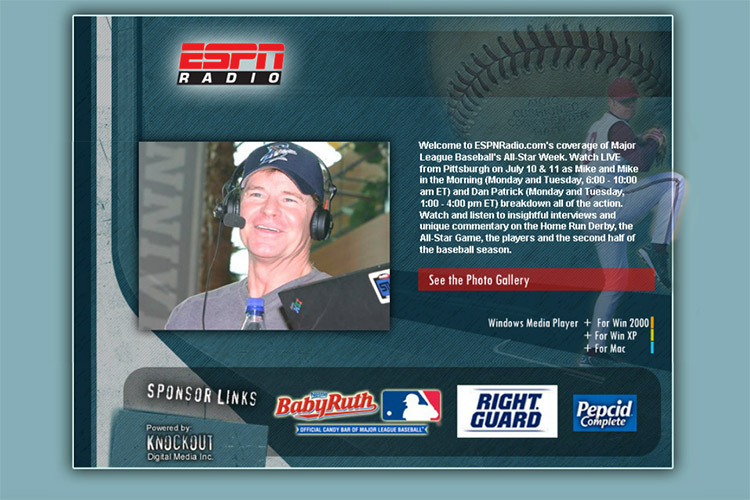 In this live stream, it was Dan Patrick’s ESPN coverage of the all star game in Pittsburg. Knockout Digital Media provided all the on site live webcast equipment, live radio engineering and live viewer page design, development and delivery. 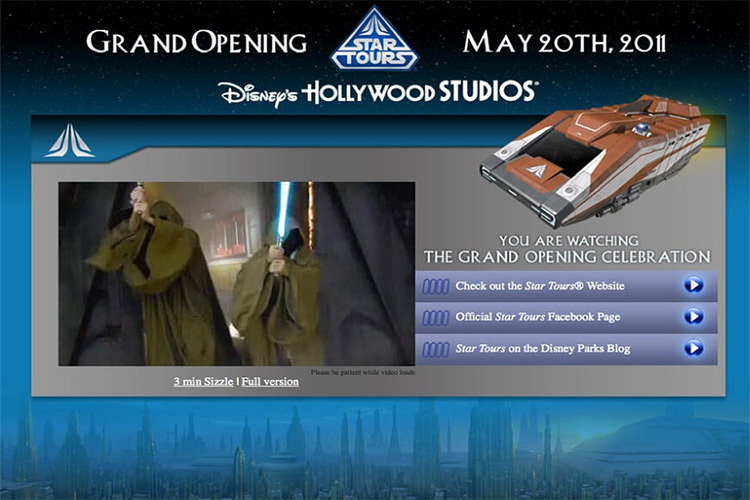 This was one of the most memorable live webcast events we have delivered, the Grand Opening of Star Tours at the Disney Hollywood Studios. Knockout Digital Media delivered a global webcast featuring George Lucas as the ribbon cutter for the event. It was more like a Star Wars Reunion and we were proud to be part of the production. 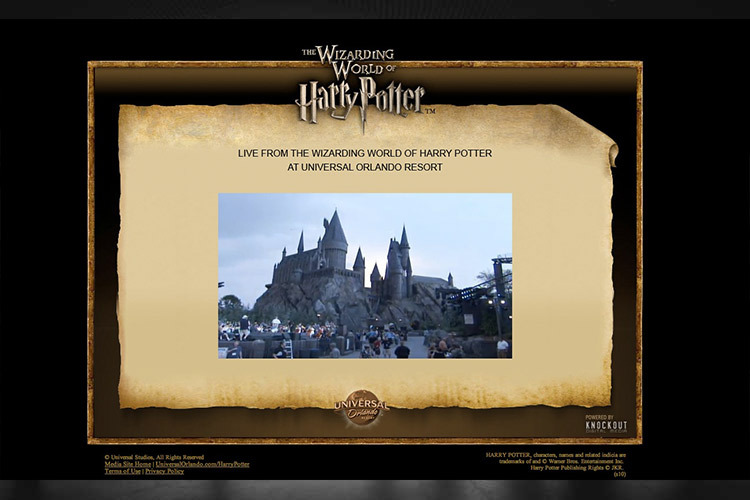 Knockout Digital Media was contracted to deliver the grand opening of The Wizarding World of Harry Potter live webcast. Knockout Digital Media consulted and executed the live webcast to a global audience. 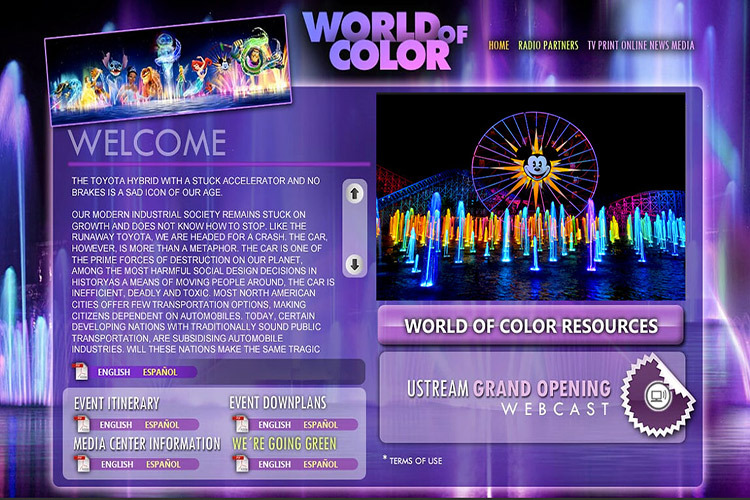 It was the first live webcast grand opening Universal Studios had ever produced. This was truly a team effort between Knockout Digital Media and the production team at Disneyland. 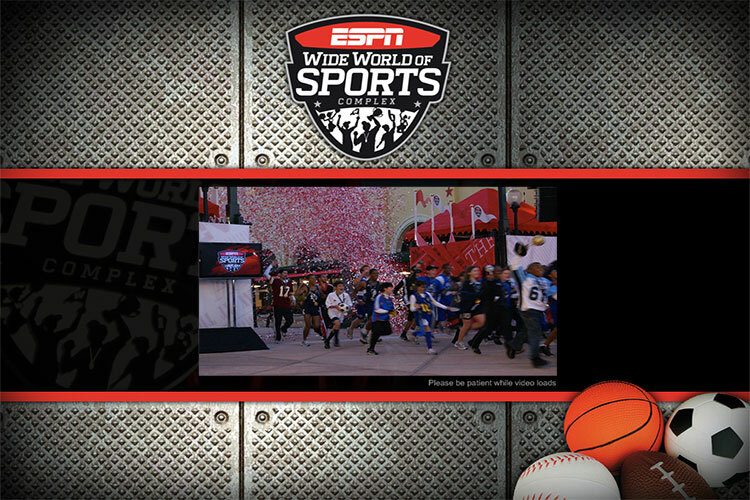 Knockout Digital delivered the webcast platform, the player page design and development and the Disneyland team executed the production while Knockout Digital managed the live stream remotely. 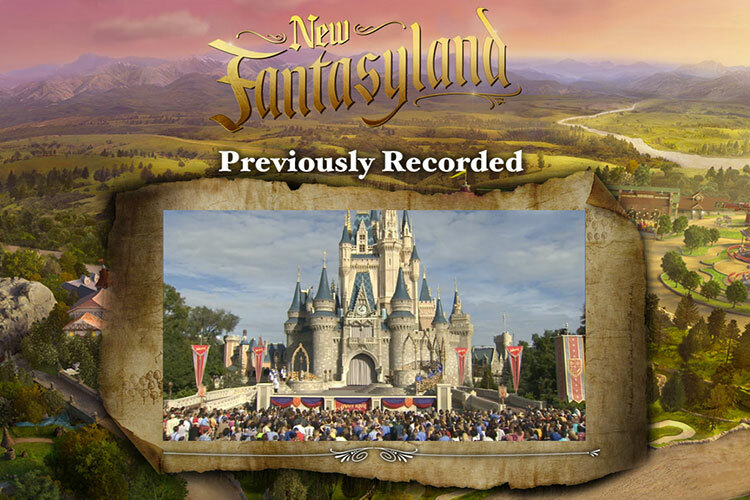 The key about this production and live webcast, which was a huge success was that it lasted 24hrs and featured the park visitors live on screen and enjoying the different parts of the park. The online viewer could click on any of the 4-6 live camera feeds to see what was happening all around the park. This was a huge event for the media and Knockout Digital was there overseeing the live stream and player page development. 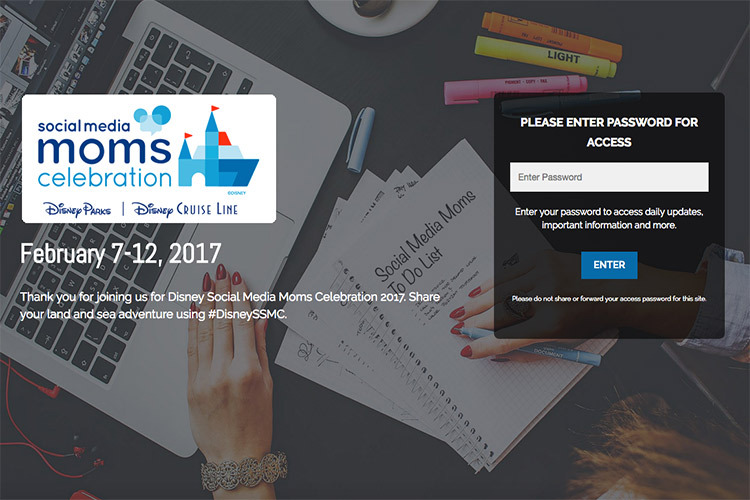 This event was featured on the Disney Corporation internal network and live on the web for all to see this grand event. Knockout Digital Media was contracted to design, develop and deliver a custom event site with login for their event attendees. This event site featured an admin panel for client html editing of parts of the event site. This event site was also developed in responsive design in order to function properly on mobile devices. Knockout Digital Media was contracted to design, develop and deliver an online media bank site for visiting event attendees. The site was to hold and allow event users to download key event media files, from videos to pdf documents. 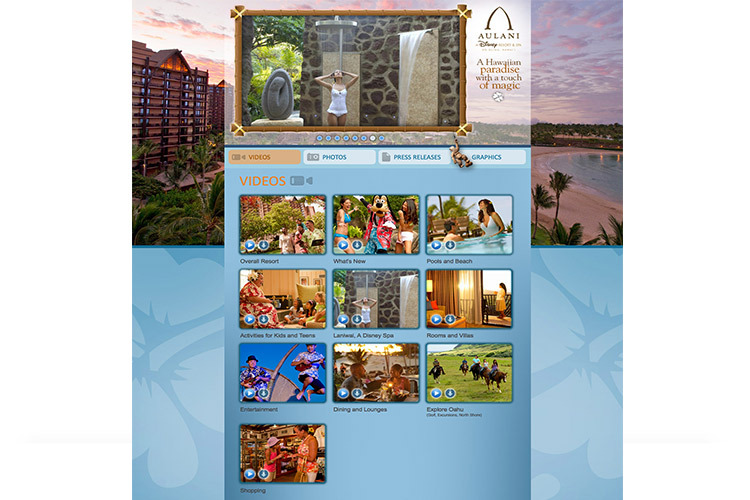 The site was used for the new grand opening of Disney’s Aulani Resort in Hawaii. 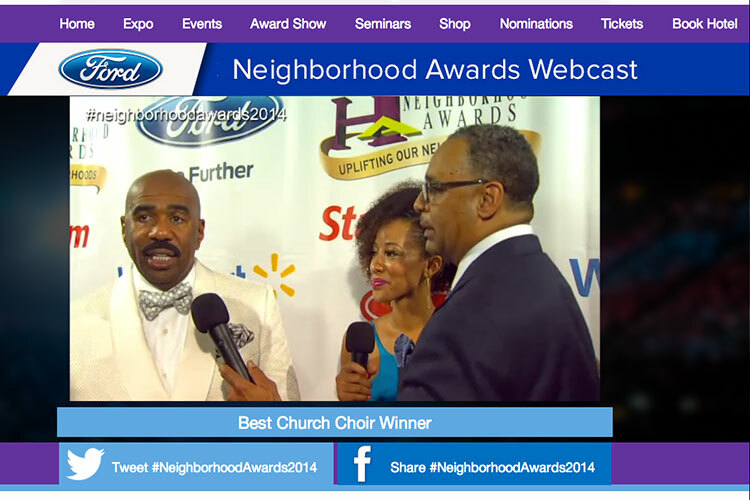 As long time online providers of web services to Steve Harvey and Rushion McDonald, Knockout Digital Media delivers 3 years of the Neighborhood awards live streams for the nation to view. Knockout Digital Media developed the player page and produced the delivery of the live streams and all social media live pieces of the production. We are Knockout Digital Media love it when technology is pushed to the limits and it most certainly was during the World of Color Tour. 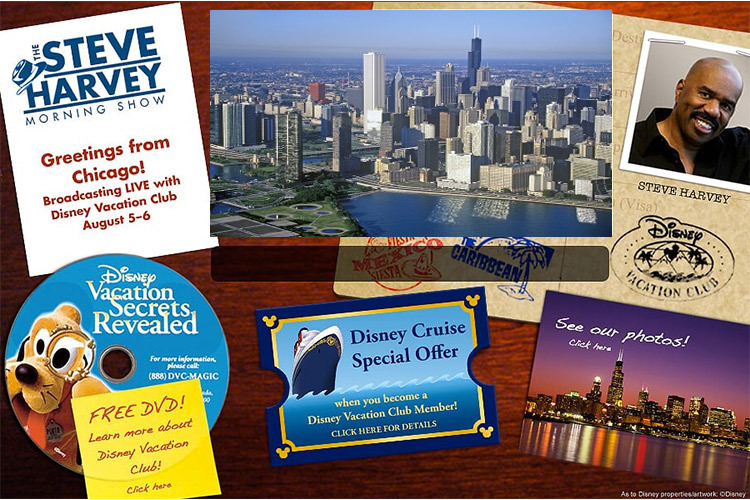 This multi-city tour gave each stop new vision of what was expected when the new Disneyland attraction opened up. Projection on water fountains and their spray was genius and ahead of it’s time. Knockout Digital Media brought this multi-city tour to the globe via a nightly webcast from each city. 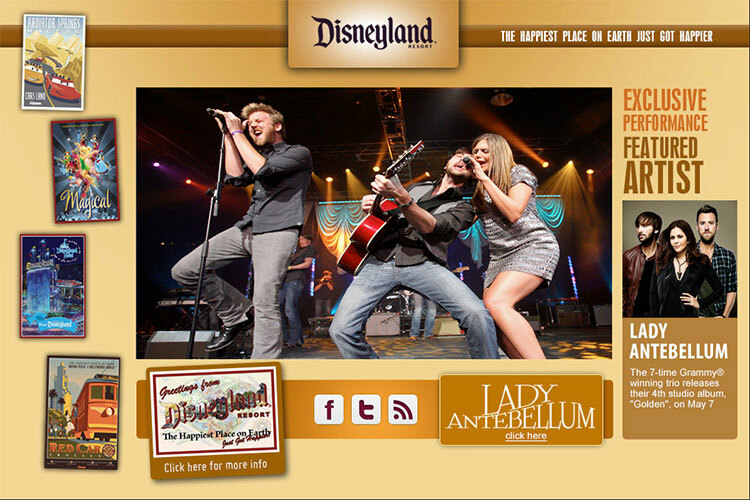 The Disneyland production team handled the live production and Knockout Digital Media designed, developed and supported the live stream delivery serverside. This production was a huge success and made global news. Knockout Digital Media was contracted to develop a system for viewing content that was connected to Youtube or any of the other video sharing platforms. 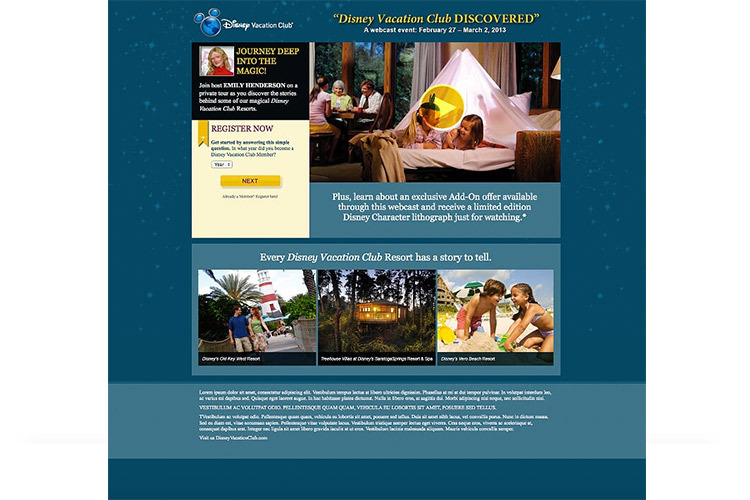 Disney Vacation Club wanted their own video platform and registration system to collect in depth analytics during the event viewing times. This was a huge design and development task and Knockout Digital Media knocked it out of the park with 16 completed events in a 7 year time span. This was cutting edge and Knockout Digital trail blazed passed the competition with our deign, development and delivery. Knockout Digital was honored to have been contracted to produce a live webcast that was to delivered to a global audience for Garth Brooks. This was not a concert, this was a private meeting with select media to discuss the new and upcoming GB Tour. 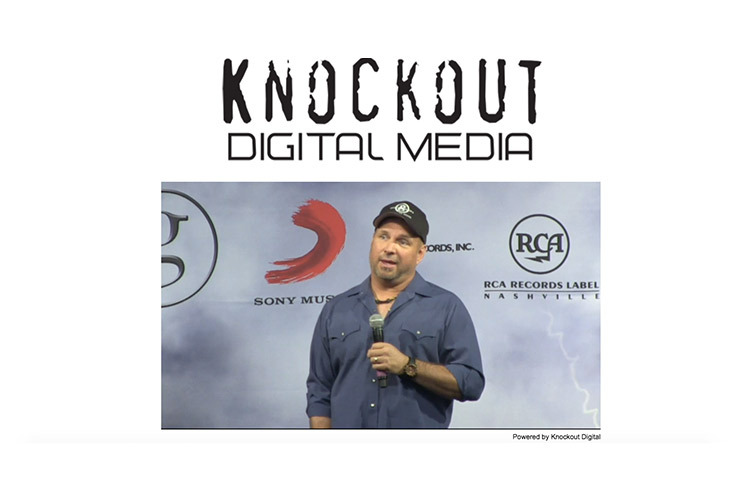 Knockout Digital worked closely with Sony and delivered a live news meeting and Q&A that was a huge success. As a long time streaming service provider tech company to Disney World and Disneyland, Knockout Digital Media was called upon many times to design, develop live streaming and video pages for various events featuring Steve Harvey and his morning radio team. Knockout Digital Media delivered the streaming platform and the player page for the Chicago event. A huge success and it was the beginning of various projects we would work on with the Harvey and McDonald team. Knockout Digital Media was the lead development team from concept to execution of this custom virtual event system. The Knockout Digital Media team has many years of experience developing lead generation registration systems, data collection systems, custom admin event manager tools and RSVP systems for the virtual events. Knockout Digital was contracted to design and develop the player page and produce a stream for this live Mansion view as actual live guest walked through this haunted house. It was streamed out for the public to watch and linked from the Universal Studios website and social media platforms. We had the privilege of working with Knockout Digital on two marquee events, and they knocked it out of the park both times. Professional, courteous and buttoned-up. When we have webcast needs in the future, Knockout Digital will be our first call. Knockout Digital delivers a knockout every time! Our online webcasts and events are in good hands with Knockout Digital. They were the first to bring live webcasting of our events to our online and mobile audiences. Knockout Digital was on the leading edge of the live streaming revolution even back in the early days of internet. Adding live video streaming to ESPN Radios’ hot properties years before the other guys. If you need to reach us for assistance on your next digital media project, event site development or live stream event, just use the Facebook chat box below and we will get your message immediately. If you prefer to leave us a message on the phone, you can do so at the number below. Copyright © 2019 Knockout Digital Media / Online Event Specialists.